The cost of fixing the cycle track along Roland Avenue could range anywhere from $200,000 to $1.4 million, depending on which option the city decides to pursue. Acknowledging that the 2½-year-old track presents numerous safety hazards and is unusable during parts of the year, the city Department of Transportation (DOT) unveiled five corrective measures during a two-hour briefing session last night. 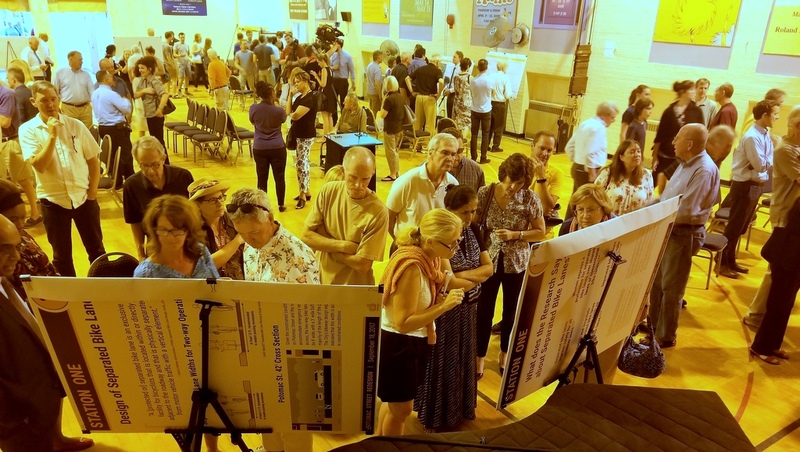 More than 200 people crowded into the auditorium at the Roland Park Elementary/Middle School to listen to how the options differed from one another, what they might cost, and when they could be implemented. Residents also had a chance to meet the DOT’s recently installed director, Michelle Pourciau, who wasn’t responsible for installing the cycle track (that was done under the tenure of William Johnson), but is charged with fixing it. 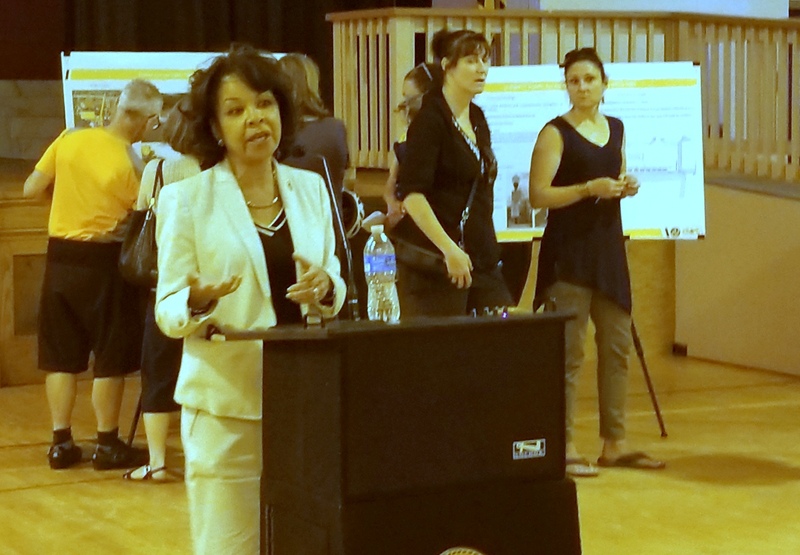 In her remarks, Pourciau stressed that the city wanted to make a safer cycle track by addressing the needs of those who live in the area and those who travel on Roland Avenue to get somewhere else. But in a smaller meeting with fewer residents, Pourciau disclosed that the city only has money in hand to implement one of the five options – the one with the lowest ($200,000-$250,000) price tag. DOT’s preferred option is to reduce Roland Avenue’s two traffic lanes to one in each direction. She said the city probably could find enough money for two other options that each have price tags of $600,000 to $750,000. “We could figure it out,” she said. As for the two most expensive options, costing $700,000 to $1.4 million, the city currently doesn’t have a source of funding, she said. Planners said the three cheaper options could probably be completed during this calendar year, assuming funds can be found, but the other two likely could not be completed until 2019. Some residents questioned whether the least expensive option would represent enough of a change to address the track’s shortcomings. The cycle track was installed in 2015-2016 over a one-mile stretch of Roland Avenue, from Cold Spring Lane to Northern Parkway. The changes to the track would be carried out only between Cold Spring Lane and Deepdene Road. The northern segment of the track (Deepdene Road-Northern Parkway) would remain the same. As built, the installation includes a dedicated, four-foot-wide lane for bicyclists next to the curb on each side of the street, with a lane to park cars next to that. The parking lane separates and buffers the bike lane from moving traffic, but it also leaves parked vehicles out “floating” where traffic previously flowed. The resulting design has drawn persistent criticism for its appearance, the difficulty of keeping it free of rubbish, and for safety issues, even for the cyclists it was meant to protect. Residents say that more than 100 cars have been hit while parked in the “floating” lanes, and at least two children have been injured. Some cyclists say they won’t use the curbside track – which accumulates leaves, sticks and other debris that makes it slippery after it rains – and instead take their chances out in the traffic lanes. DOT promised to address community concerns after an initial “test” period to see how the track functioned in all seasons and weather conditions. That test period is now over and the flaws have been chronicled, leading to the attempt by planners to make revisions with guidance from the community. Some cyclists say they won’t use the curbside track, which accumulates leaves and other debris that makes it slippery after it rains. Last night’s briefing session was organized so residents could learn about the five options by visiting several different briefing stations where charts and drawings were displayed, and talking to DOT representatives available to explain the pros and cons of each and answer questions. Outside of Pourciau’s brief remarks, there was no point where residents formed a single audience and could listen as one person spoke, and there were no handouts to take home and study. Throughout the briefing, planners asked residents to fill out comment forms stating which of the five design options they liked and why. Residents were told they could also email comments to: DOT-Community@baltimorecity.gov. OPTION 1: Widen the parking lane, but still keep it “floating” between the bike lane and moving traffic. Reduce traffic lanes from two lanes to one in both directions. This is DOT’s preferred option. Estimated cost: about $200,000, with all of the work completed within 2018, according to city planner Matt Warfield. The cost was low because it was primarily involved remarking the street surface, planners said. OPTION 2: Remove the floating lane of parking and move parking back next to the curb. Create a bike lane alongside the parked cars, and maintain two travel lanes in both directions. This is the option closest to returning the arrangement to the way it was before the cycle track was installed. Estimated cost: Roughly $600,000 to $750,000, Warfield said. Timetable: Could be completed within 2018, assuming funds are available. OPTION 3: Remove the floating lane of parking and move parking back next to the curb. Install a “buffered bike lane” alongside the parked cars. Reduce travel lanes from two lanes to one in both directions. Estimated cost: About the same as Option 2, Warfield said. Could be completed within 2018, assuming funds are available. OPTION 4: Remove the floating lane of parking and the protected cycle track. Restore curbside parking. On northbound Roland Avenue, create a two-way cycle track next to the median and separate it from moving traffic by flex posts or curbing. This two-way track would work the same way as the cycle track on Maryland Avenue. On southbound Roland Avenue, create a buffered bike lane alongside parked cars. Reduce travel lanes from two lanes to one in both directions. Estimated cost: $700,000 to $1.4 million, Warfield said. Timetable: Could not be completed within 2018. Could possibly be completed by end of 2019, depending on availability of funds. OPTION 5: Remove the floating lane of parking and the protected cycle track. Restore curbside parking. Create one-way cycle tracks hugging both sides of the median with flex posts or curbs delineating the cycle track. Have a northbound bike lane on the side of the median with northbound traffic, and have a southbound bike lane on the side of the median with southbound traffic. Reduce travel lanes from two lanes to one in both directions. Estimated cost: $700,000 to $1.4 million,Warfield said. Timetable: Could not be completed in 2018 but possibly could be completed in 2019, depending on availability of funds. 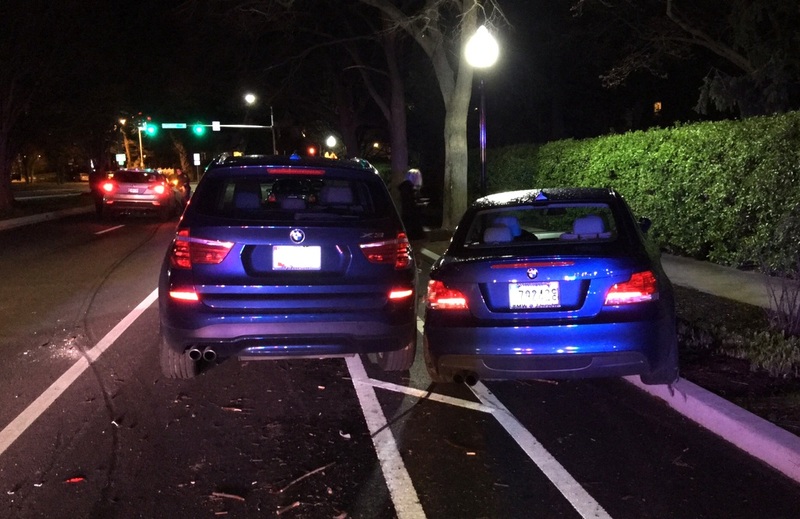 A photograph of two cars in the “floating” parking lane sideswipped by another car along Roland Avenue taken by resident Leslie Goldsmith. Reaction to the presentation was generally positive, with residents giving planners credit for showing a range of ideas. Some in attendance said they sensed, however, that DOT was inclined to go with its “preferred” $200,000 option no matter what the feedback was, because it was a change the city could implement quickly. They questioned whether that option would be best because it kept the parked cars floating in the middle of the road. Many residents want to see curbside parking restored, Civic League President Robert Connors said. “Thanks @BmoreCityDOT for presenting a cost-effective, safer solution for Roland Ave. as the preferred alternative tonight,” Jed Weeks tweeted. Chris McSherry, first vice president of the Roland Park Civic League, said she was pleased with the turnout because it would better educate area residents to the options in front of them. Connors also said he was hearing that many people want to see curbside parking restored. “That seems to be what the community is asking for,” he said. Liz Cornish, executive director of the advocacy group Bikemore, complemented DOT for its presentation, saying she found it “very productive” and was glad that the level of discourse remained civil. “We want the bike lane to remain a protected bike lane, we want traffic to move more slowly, and we want to city to be judicious in terms of how many more resources we are putting toward this,” she said. 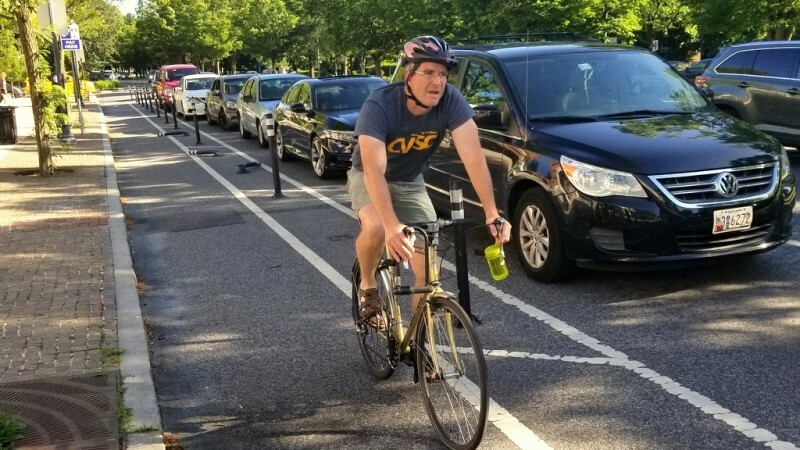 Bikemore’s policy director Jed Weeks gave the DOT’s preferred option the thumbs-up on Twitter. “Thanks @BmoreCityDOT for presenting a cost-effective, safer solution for Roland Ave as the preferred alternative tonight,” he tweeted. For those who missed the meeting or went and want to review the five options again, city officials said they would be viewable online at www.transportation.baltimorecity.gov. The comment period runs from June 14 to June 28. DOT says it will post its final decision online on July 5.